BBC News Online highlights the key movies in the development of the British film industry. A worldwide box-office hit, with takings of more than $258m, this British comedy briefly rescued the British film industry from a moribund period of flops and failures. 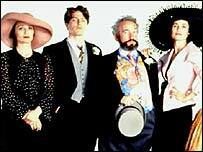 A wonderful ensemble cast is led by Hugh Grant in the role which defined his career. Richard Curtis provided the high-quality script, sparking a spate of copy cat British romantic comedies. The input of director Mike Newell is often underestimated; he produced a style which felt both contemporary and traditional, harking back to British comedies of old. The film was the first blockbuster success for Channel 4 films, set up 12 years later, although its international popularity came as a surprise to all invovled. In fact, the film had to find success in America before British audiences would even consider it and much of the funding was from the US. The success of the film led to hopes the British industry could once again rise from the ashes but the optimisim failed, like the finances for film, failed to last.